The Monarch butterfly (Danaus plexippus) is the most familiar North American butterfly. During their fall migration, monarchs cover thousands of miles to overwinter in Florida and Mexico, then return in the Spring. The name “monarch” is believed to be given in honor of King William III of England, whose secondary title Prince of Orange makes a reference to the butterfly's main color. There is increasing concern related to the ongoing decline of monarchs at their overwintering sites, with some studies showing their population has declined by more than 90% since 1995. That said, they have not yet been listed under any Endangered Species act. 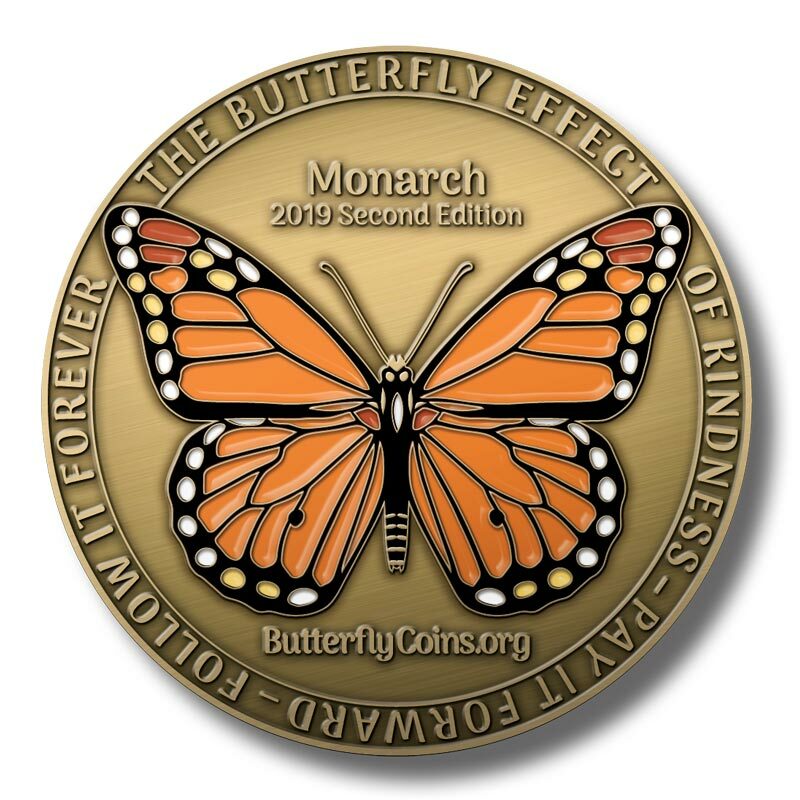 Like our First Edition coins, this Second Edition is minted in 3mm-thick solid brass, weighs 55 grams (2 ounces), and features a 5-color hand-painted butterfly. The back is laser-etched with a unique tracking code for each coin, and each will travel the earth forever spreading kindness and collecting stories from its journey. Also like our First Edition, when this Second Edition coin is sold out, it will be sold out forever and not re-minted. NOTE: The tracking code in the picture below (abcd-123) is just an example. Each Butterfly Coin has its own unique code.